3 lyrical and gentle nature studies evocative of the pastoral or " bucolic " outdoors for solo piano written in May 2016 at the request of a family member who wanted me to play something " calm and refreshing " for their birthday party . 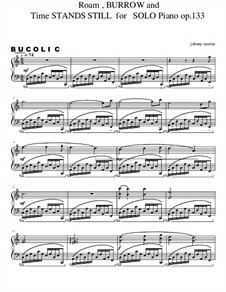 I was delighted with the request and wrote the 1st bucolic here but didn't have the chance or time write an arrangement of Happy Birthday - that will be accomplished soon . Am pleased to offer it here . It can also be heard on Soundcloud under my name - John Martin III .